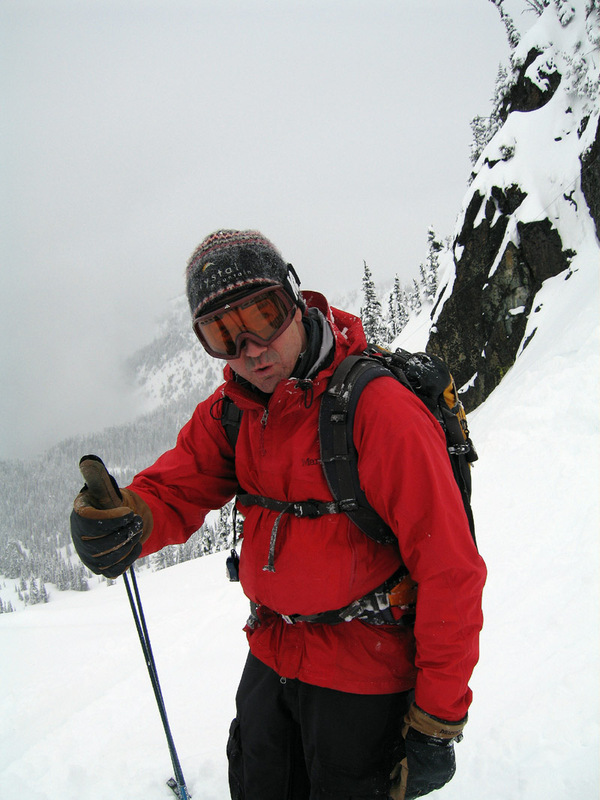 We'd been talking about hooking up with Tim Petrick to do some ski touring for some time now, and when he e-mailed about meeting up at Crystal on April Fool's Day, it seemed like the perfect opportunity for some fun. Mike and I pulled up in front of the Marketing Office shortly after 8:30 AM to find Tim chatting with some old acquaintances - Keith Rollins and Wayne Greevy, Martin Rand of Sturtevant's, and Tim's friend Paul. It turned out that Tim's plan called for Keith and Wayne to show us around, which sounded ideal, as probably no one at Crystal knows the area as well as they do. I was a little apprehensive about my choice of F1's and Dynafits as I checked out their burly alpine boots and Seth Pistols, but I was committed to the gear I brought, so we headed on up. Keith wanted to do a lift-served "warm up" in the far Northback, so we followed him up REX and out the access traverse to the ski area boundary ("you are on your own, IF AND WHEN help arrives . . .") to what they called the Goat Chutes. 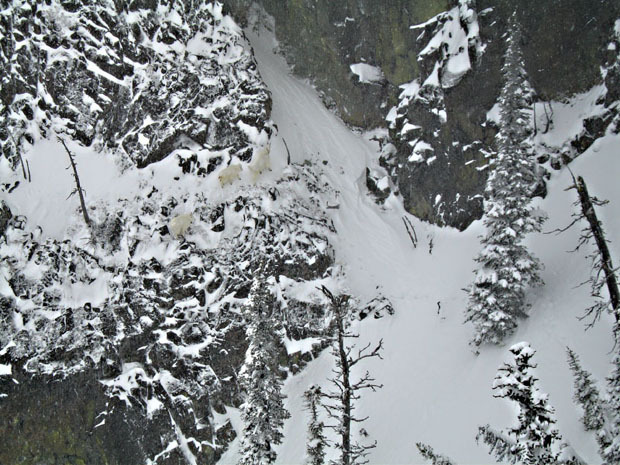 Sure enough, goat tracks (but no goats) were in abundance at the entrance of the first chute. Tim did a ski cut, which produced a clean slab on the top 4" of fresh, but the semi-frozen underlayers seemed pretty bomber. 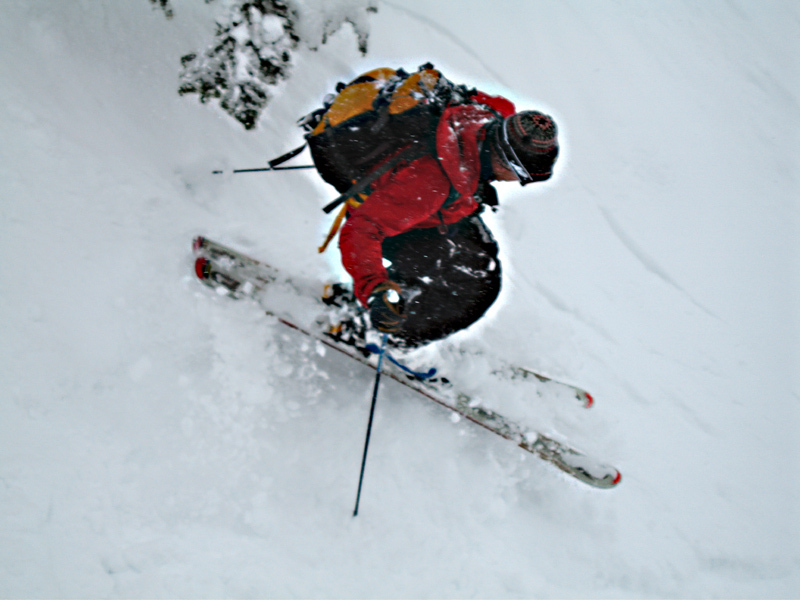 We skied the line one at a time, trying as best as possible to pull up out of the slough path when we stopped, which was a little difficult due to the narrowness of the chute. 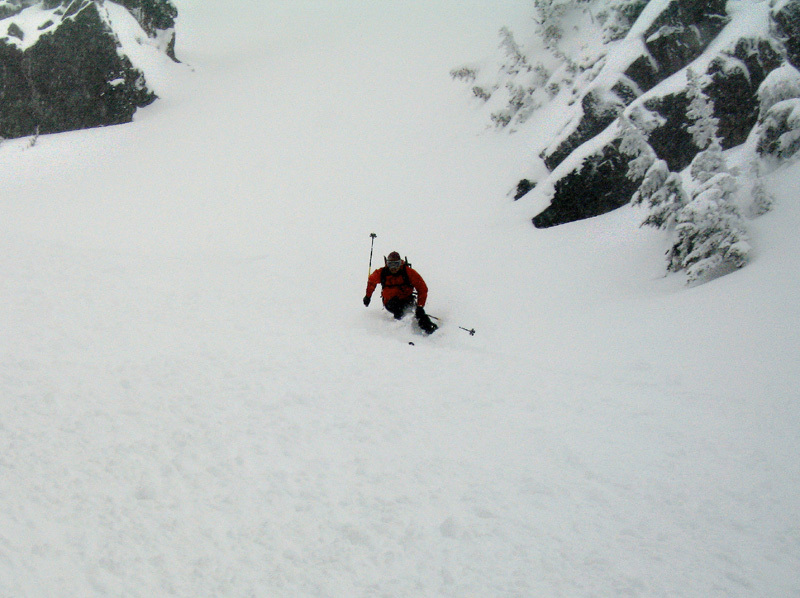 Top and bottom produced some nice turns, with the middle section of frozen avy debris a little scratchy but still fun. Getting out involved skiing the summer mountain bike trail down to the Crystal road, then hitchhiking back up to the lodge in stages after Wayne's several cell calls to the office failed to produce a shuttle bus. 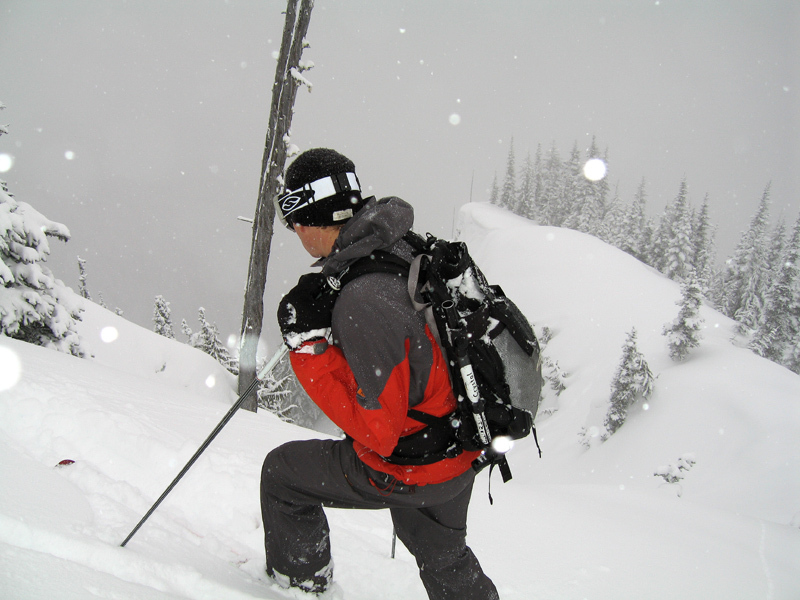 We regrouped at the base area, and the K2 boys switched to their "touring" setups - as it turned out, these were the same beefy skis as they had just been using, but with NAXO NX21's mounted up. We took the series of three lifts up to the Southback, and headed out around the back of Silver King. From there, we headed out of the ski area, dropping down the SW flank of the "King" toward Crystal Lakes. Six to eight inches of untracked over some soft-frozen crust made for nice turns down into the basin, after which we put on skins and began heading for the gap looker's left of Crystal Peak. Traversing around the west rim of several peaks, we spotted a family of mountain goats on the upper slopes of Point 6706, who exhibited uncanny agility in negotiating the steep slopes. The "dad" goat was sporting a bright red collar of some sort, presumably some sort of tracking device. Continuing to climb and traverse, we ended up at the top of a nice bowl funneling down to Sheep Lake - Keith commented that the run was known as Shepherd's Chute. Tim ski cut the top and the wind-loaded east aspect slabbed off nicely to a depth of around 12 inches, which made the skiing a bit lumpy but still fun. Sheep Lake looked kind of familiar; after looking around for a minute or two, I remembered camping there as a Boy Scout years before! 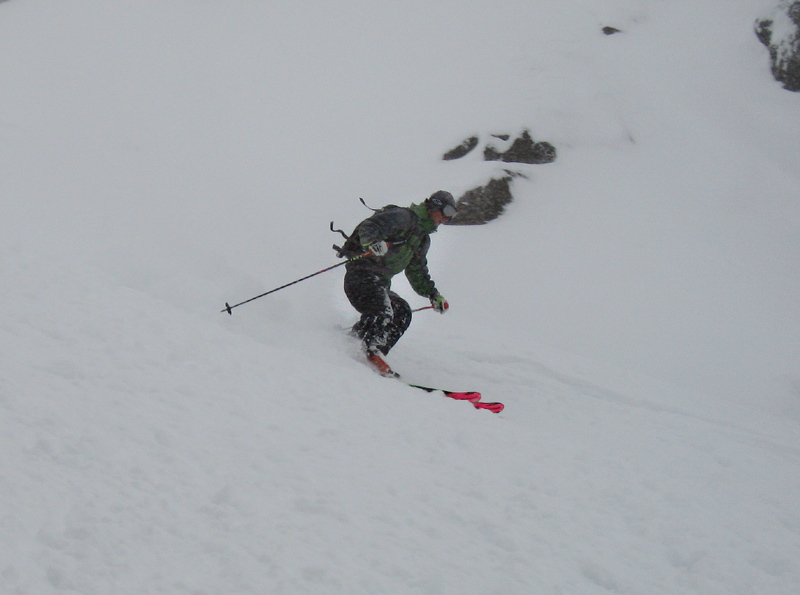 To finish off, we traversed over toward Sourdough Gap, then donned skins again and climbed to the saddle next to Threeway Peak before dropping back into the drainage leading back to Chair 4 and the world famous Snorting Elk bar.